Amy Thompson McCandless received her A.B. degree in history from Sweet Briar College in Virginia, her M.B.A. in personnel from the University of South Carolina, and her M.A. and Ph.D. in modern British social history from the University of Wisconsin. She began working at the College of Charleston as one of the editors of South Atlantic Urban Studies in 1976 and joined the history department in 1981. 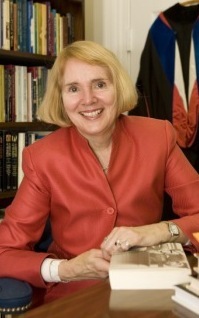 From January 2001 to June 2006 she served as Associate Provost. In July 2006 she became Interim Dean of the Graduate School and Associate Provost for Research and in March 2008 was appointed Dean of the Graduate School. In December 2007 President Benson asked her to co-chair the Strategic Plan Steering Committee with Dr. James Deavor, Chair of the Department of Chemistry. As Dean of The Graduate School, she wants to increase the visibility of the College's graduate offerings both regionally and nationally, to promote opportunities and funding for individual and collaborative graduate student research, to review program structures and curricular offerings to ensure that they best enhance the missions of the College and The Graduate School, and to increase faculty development and research opportunities. She serves as faculty sponsor for the Graduate Student Association and sponsors monthly "Dinner with the Dean" events that bring together graduate students from every program for camaraderie and conversation. Professor McCandless has taught undergraduate and graduate courses in U.S. women's and British history. She has also offered special topics classes on Women in the U.S. South, Elizabethan England, and South Carolina history. As British Studies Coordinator from 2000 to 2006 (See information on the British Studies Program), she developed the College's British Studies Minor. For ten years she was involved in facilitating exchange programs with the United Kingdom and led travel abroad classes to England and Scotland from 1999-2006.Although her involvement in international programs is currently focused on graduate students, she continues to serve as the College's Fulbright Campus Representative. The majority of Professor McCandless' research has been on women's history. Her book, The Past in the Present: Women's Higher Education in the Twentieth-Century American South was published by the University of Alabama Press in 1999 and won the History of Education Society Book Prize in 2001. She has also written a number of bibliographical essays on British women for European Historical Biography. As former chair of the Historic Commission, Town of Mount Pleasant, Dr. McCandless is very interested in South Carolina history. She was one of the associate editors of the South Carolina Encyclopedia published by the University of South Carolina Press in 2006 and continues to work on several projects highlighting the lives and contributions of South Carolina women. Professor McCandless is past-president of the Southern Association for Women Historians (SAWH) and chair of the editorial board of the South Carolina Historical Magazine. As a member of the Lowcountry Phi Beta Kappa Association, she is working with the Dean of the Honors College, John Newell, to prepare the College of Charleston's application for a charter.